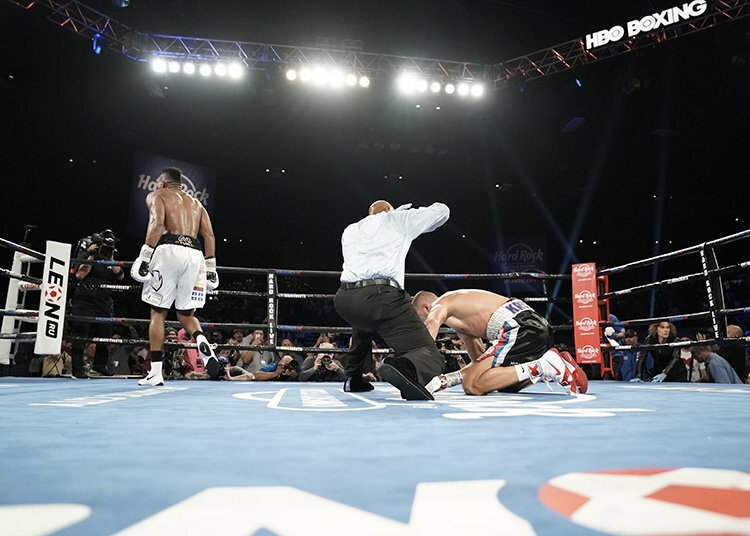 The seventh round demise of WBO world light heavyweight champion Sergey Kovalev to the Colombian Eleider ‘Storm’ Alvarez came as no surprise to the mentor of Anthony Yarde, top trainer Tunde Ajayi. Ajayi had his card marked that Krusher was about to be caught in a Storm by Frank Warren, when the pair chewed the fat over the division at a meeting last Monday. Warren’s prediction prompted Ajayi to book a last minute working holiday for himself and the WBO No.1 ranked light heavy – who also holds the governing body’s European and Intercontinental belts after 16 unbeaten bouts as a professional – to Atlantic City to see firsthand if the promoter had called it correctly. “Myself and Frank met on Monday and we both said in the meeting that Kovalev is ready to go,” said the Peacock Gym-based trainer. “I was going more by what Frank was saying and said that I needed to see it for myself. “When I got home on Monday night I phoned Frank and said I needed to be there. Frank said it to me, ‘he is ready to go’ and, while I don’t like to second guess Frank, I did say I needed to see it for myself. “So I said to Frank that I need two tickets to watch the fight. Myself and Anthony flew over and I saw it for myself from the fourth round. “I said first of all that he had definitely gassed out, then from watching Alvarez for the first time I said to Ant that this guy can punch, although his record didn’t suggest as much. “It is another indication of what I say in that records are very deceiving because you can look at someone and say he’s only had ten knockouts out of 20 fights and is not a puncher. The thing is, who is he fighting and what is the resistance factor? “Sometimes, when careers are building, you are in there with tough, durable guys. Kovalev, we all know what happened with the Andre Ward situation and the fact he is 35, plus reports of his bad lifestyle. All these things are bound to catch up with you. Ajayi admits that heading Stateside and taking in events at the Hard Rock Hotel & Casino has left both trainer and fighter wanting more of the same for themselves and it appears that Anthony is already an increasingly popular fight figure across the Atlantic. “Absolutely, it is where I’ve always wanted to be as a trainer and it is where Anthony wants to be as a fighter. All these things tick boxes for Anthony because he is seeing these guys live, realising they are not invincible and realising that TV is very flattering. “It makes you look bigger than what you really are, it can make you appear faster than you really are and another thing you don’t get on TV is the sound effects of the punches! “Being there is real and it puts things into perspective. “My overall analysis is I am very optimistic, confident about the future, but I am also realistic in seeing things for what they are at the present moment. “I am opening Anthony’s eyes because this is where he’s going to be. The fan love was amazing, with literally every step we took it was ‘hey Yarde, Yarde’ or ‘can I get a picture Yarde’. Before heading home on Wednesday, Ajayi and Yarde have been invited behind closed doors to train at the gym of Danny Garcia as he prepares to face Shawn Porter for the WBC world welterweight title in September. “On Monday and Tuesday we will be training alongside Danny Garcia. Everybody knows Danny Garcia has got a closed camp, but the dad – Angel – and Danny has requested us and said it would be an absolute honour and privilege to have us in the gym.